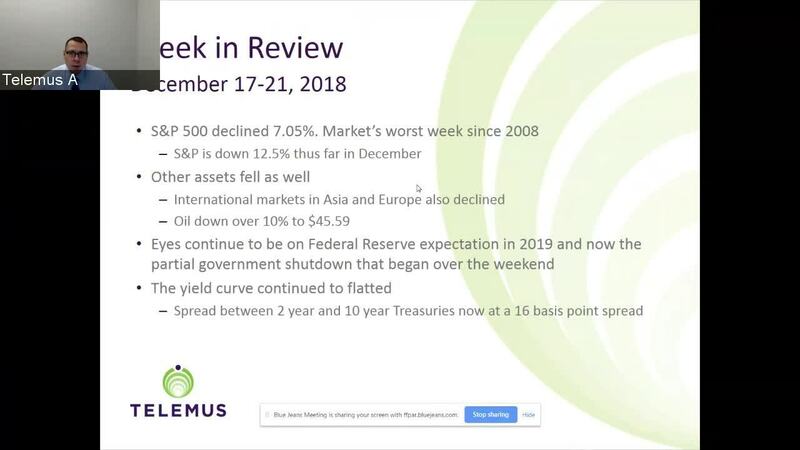 The markets suffered their worst week’s performance since 2008 last week amid ongoing concerns over economic growth, trade, the threat of a government shutdown, and fear the Federal Reserve could be on course for making a policy mistake. The S&P 500 dropped 7.05%, setting a new yearly low at 2408.12 and bringing the benchmark index's decline to 12.53% in December. The Dow Jones Industrial Average, down 6.87%, the Nasdaq Composite down 8.36%, and the Russell 2000 down 8.4% also extended large monthly losses. Losses were widespread with all 11 S&P 500 sectors posting weekly losses, ranging from 4.5% for the utilities sector to 9.0% for energy as there was a broad-based de-risking effort. The S&P 500 would test its February low of 2532.69 three times last week: twice before the Fed's decision and once after the Fed's decision. The first two re-tests invited some late buying interest that enabled stocks to close off their worst levels in their respective sessions. The third test, however, failed on Wednesday due to a sense of disappointment that the Federal Open Market Committee, and Fed Chair Powell, didn't deliver on the market's wishes for a more dovish-sounding perspective regarding the interest rate outlook for 2019 and the Federal Reserve's balance sheet management. In terms of the Fed decision, the target range for the fed funds rate was increased by 25 basis points to 2.25% to 2.50%, as expected, and the so-called dot-plot was revised to show a median projection for two rate hikes in 2019, versus three previously. Fed Chair Powell irked the market during his press conference on Wednesday when he said policy does not need to be accommodative now and that he doesn't believe the current policy is restrictive and he does not see the Fed altering its approach to balance sheet normalization and sees the preferred policy method being use of the fed funds rate. New York Fed President John Williams offered a seemingly more dovish sounding outlook on Friday when he said in a CNBC interview that the Fed is listening to the market and that a balance sheet runoff is not "inflexible." Those remarks triggered a rally effort, but true to recent form, there was selling into strength. Some other troublesome elements that weighed on investor’s minds last week included the possibility of a partial government shutdown due to disagreements over a funding request for a border wall, concern that the U.S. and China aren't going to be able to reach a trade agreement on structural issues in their prescribed 90-day window, and the understanding that credit markets appear to be anticipating a growth slowdown due to tighter monetary policy. Falling oil prices, which closed Friday at $45.59 a barrel a loss of over 10% for the week, didn’t help matters and fed into concerns about economic growth. Uncertainty, and the inability to sustain any rebound effort from short term oversold conditions in the stock market, ultimately held back buying interest and led to a flight to safety in U.S. Treasuries. The Fed-sensitive 2 year yield and benchmark 10 year yield dropped 10 basis points each to 2.63% and 2.79%. Overseas last week Asian stocks fell further Friday with Chinese stocks on track to end 2018 as the world’s worst performing market, with a loss of around 24%. In Europe a key market gauge, the STOXX 600 index, finished slightly higher Friday, avoiding a fall into bear-market territory, amid nagging concerns over a global growth worries. Fears about slack in the international economy drove all the major European indexes to weekly declines of around 2% or worse.